My brother was never an affable, happy-go-lucky kind of guy. In fact, it was his frankness and humility that I most liked in him: he didn’t see a need for putting up pretenses, for dancing around issues that bothered him. When we went to an uncle and aunt’s 50th wedding anniversary, he didn’t make any motions to show a false happiness. His demeanor represented what he felt: a brave, admirable struggle with chronic pain, but a willingness to appreciate life’s small pleasures in spite of it. As he told my mom once, there is always something to enjoy: whether it be the fluttering of a pigeon, the taste of an apple, the rattling of a train. The sights, sounds, and images of the world have a beauty that is always available to us—if only we are willing to pay attention to them. Such age-old wisdom was not bad for someone who was barely twenty-six. During his final year, he was condemned to wearing a back and neck brace to support his fragile skeleton. He still found a way to tease, laugh, and smile. Anthony wasn’t always so appreciative of the little things. For years, his life was consumed by imagery and fantasy, a fleeting, two-dimensional connection with the world that spun magically from scintillating pixels on a television screen. Down in his dark basement, sitting on his beige leather recliner, his interaction with the “world” was limited to the frontal plane, a one-directional visual reception of comical mishaps with the Simpson family, the Griffin family, or some other amusingly broken social unit. While the rest of us were clocking in to our jobs or classes, my brother would go through passing seasons watching shows that put a comical spin on our social world (Late Night with Conan O’Brien, The Colbert Report), or movies that played with heart strings and stomachs. The allure of fictional worlds also presented itself in the various video games he collected and played over the years: worlds where you could kill and car-jack with impunity, where you could slay dragons and reptilian monsters, worlds where you were incredibly fit and powerful. That he was finding such reprieve in worlds of entertainment and fiction should be no surprise: how else to live through an interminably painful and hopeless condition than to watch endless reruns of shows where lighthearted fun could be found in unrealistic yet hilariously absurd scenarios? Shows or games where you could detach yourself from the pain and isolation of everyday reality, and pretend that your biggest concerns are of the pettiest, materialistic types? It was a year ago today that the person who taught me the most—my one and only older brother—passed away. His death was not a surprise to me and my family. It came about through one of the worst possible ways, like a long Shakespearean death…except much less romantic. He died from the months of blood-letting that came from years of chemo-radiation, not for cancer, but for an insidious, rare disease that reared its head in childhood. It’s called Langerhans Cell Histiocytosis (sometimes also known as Histiocytosis X; it’s definitely never a good sign when your condition has an ominous ‘X’ in it). He suffered, for most of his short life, from something that most of us are fortunate enough to never encounter—a rare disease that stumped many of his doctors and for which very few resources exist. His condition progressively destroyed his bones and wrecked havoc on his life as the pain from his breaking vertebrae prevented him from going to school, holding down a job, or having a modicum of a social life. Consequentially, my brother didn’t live out his youth the way many twenty-somethings do: his healthiest days were lived out in high school (though he was teased for misshapen back), and he took a break from college to seek surgical treatment that—it was hoped—would fix his the ongoing deterioration of his vertebrae (see spinal fusion surgery, a now-contested treatment). As that “break” extended into multiple semesters, and one surgery led to another and another, his dreams and aspirations changed. At first, he wanted to start his own business. Then he wanted to just finish college. Then he just wanted to live a healthy life. Then he just wanted to live. With every trip to a doctor, with every test and treatment, we were constantly chasing something that would never be. My parents wrestled with the possibilities of saving him until the bitter end. For all those years he spent chasing something better, he was in his basement apartment, his hopes keeping him alive. I’d like to think that the wisdom he imparted to me and my family was due to a compression of life: he had to learn, in twenty-six years, what many three times that age may be lucky enough to learn. In the days after his death, I was burdened with the responsibility of cleaning out the basement. It was one of the most laborious tasks of my life—and not simply because there was endless stuff that had compiled over twenty-six years of living. It was because of the emotional weight that each item, each DVD case or loose-leaf or T-shirt carried. The hopelessness was everywhere. There were just simply vast piles of crap—these material things that, at best, brought him a few hours of escapist entertainment. Many of the things were hardly used, or probably never used. And there before me was the evidence of his condition. The pain and loneliness could be found in the many attempts to run from it: endless piles of DVDs, video games, and outdated electronic devices. The clothes that no longer fit his shrunken frame. The college books and papers that were testament of an unfulfilled dream. The challenge of cleaning out the basement was small compared to the cross my brother bore for all of those years. In my eulogy at his wake, I made a reference to the story of Prometheus, a Titan in Greek mythology who experienced inexpressible, empyrean suffering for giving mankind the gift of fire (and inciting the wrath of Zeus). 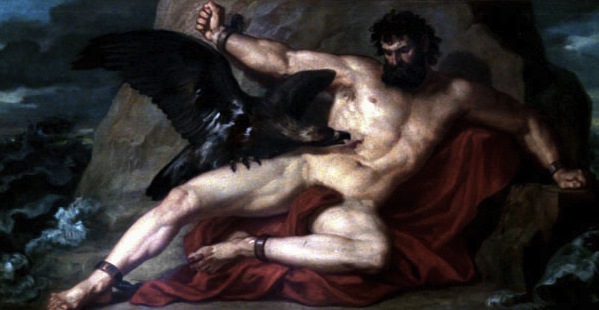 According to myth, Prometheus was chained to a rock in the Caucasus Mountains, where he was condemned to have his liver eaten by an eagle every day for eternity. Immortality conferred no special advantage to Prometheus, whose liver regenerated every night and whose suffering continued well past that of any mortal. 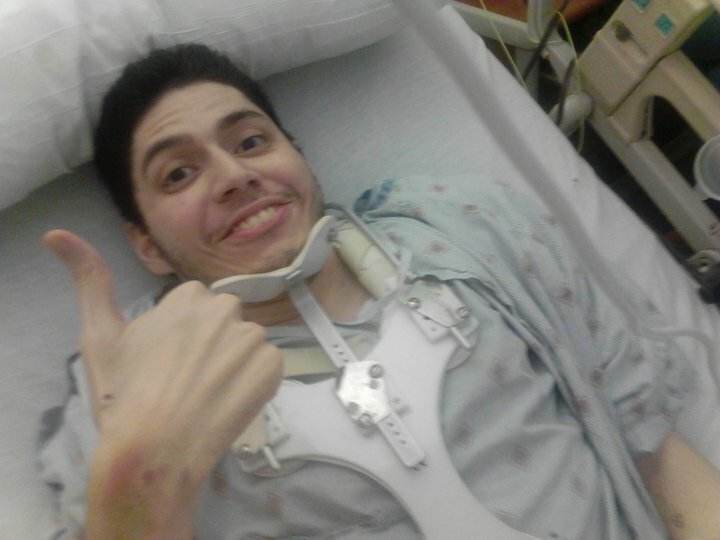 My brother’s suffering at the expense of an unrelenting disease that literally contorted his bones was, to me, nothing less than Promethean in nature: although he was no god, his mortal suffering came to teach the rest of us in the family a valuable set of lessons about the ephemeral nature of life. Much as fire is valuable for the light and heat it provides, my brother’s wisdom helped us see in the dark and grow spiritually as human beings. Although there are countless stories of human resilience in the face of adversity, my brother’s story will be the one that I’ll always keep nearest my heart. I can write endlessly about his travails and how he bore them, but what truly inspired me—and truly made me see the world anew—were the moments he showed a will to laugh. A will to smile. A will to reflect and inquire. A will to love. He showed all these things to us in spite of the incredible pain he bore. Towards the end of his life he shared what he learned with us—that the material things that once cluttered his life were insignificant in the larger scheme of things. Implicitly, in being able to laugh through a funny movie while dying, he taught us how much we can enjoy if we open our eyes wide to life, unclouded by judgments, fears, denials, hopes. Simply being—experiencing the world through sensation without cognitive appraisal—can bring us excitement and joy. Seeing the world through the eyes of a dying man, you become in tune again with that inner child that finds endless excitement in touch, taste, and smell. The child that finds pleasure in the smaller things, like the taste of an apple or smell of a flower—the things we’ve become conditioned to ignore or see as hindrances as we strive for some future goal. The inner capitalist kicks the inner child to the curb. Tells the child to shut up and listen. For once, I’ve made a deliberate decision to not easily succumb to the ways we’ve been indoctrinated; I’ve vowed to listen to my brother, whose words ring truer as I make my own journey with chronic pain. In helping me see things through his eyes, he helped me decolonize my mind just a bit more, helped me come closer to that once-pristine psychic landscape uncorrupted by avarice and competition. There’s a long way for me to go, but I’ve given up on a black-and-white notion of my destination. The road there is the destination. My brother was the greatest teacher I’ve ever had.